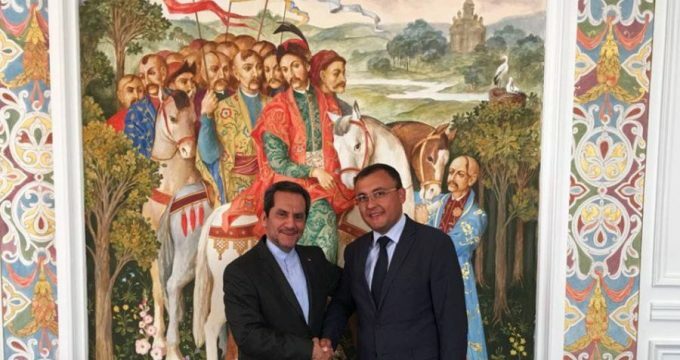 IRNA – Iran’s Ambassador to Kiev Mohammad Beheshti Monfared conferred on Thursday with Ukraine’s Deputy Foreign Minister Vasyl Bodnar on expansion of all-out relations and cooperation between the two countries. In the meeting, both sides examined issues of mutual interests and expressed hope to seize capabilities to broaden cooperation between Tehran and Kiev in various sectors. Ukrainian deputy foreign minister, for his part, referred to good development of ties in recent years between the two countries and said Ukraine’s foreign ministry is determined to broaden such relations and cooperation. In the meantime, the Iranian ambassador elaborated on measures adopted by Iran in politics, economy, culture and university student placement while appreciating Kiev for its supportive approach towards Tehran. Cultural affinities between the two countries have prepared grounds for expansion of relations, setting up joint economic commission meetings, setting up trade exhibitions, exchange of political, parliamentary, commercial, banking , agriculture, transportation and pharmaceutical drugs in recent years, Beheshti said. He also expressed hope the existing obstacles on the way towards further expansion of bilateral ties would be removed and the two nations further enhance cooperation in agriculture, energy and transportation sectors.